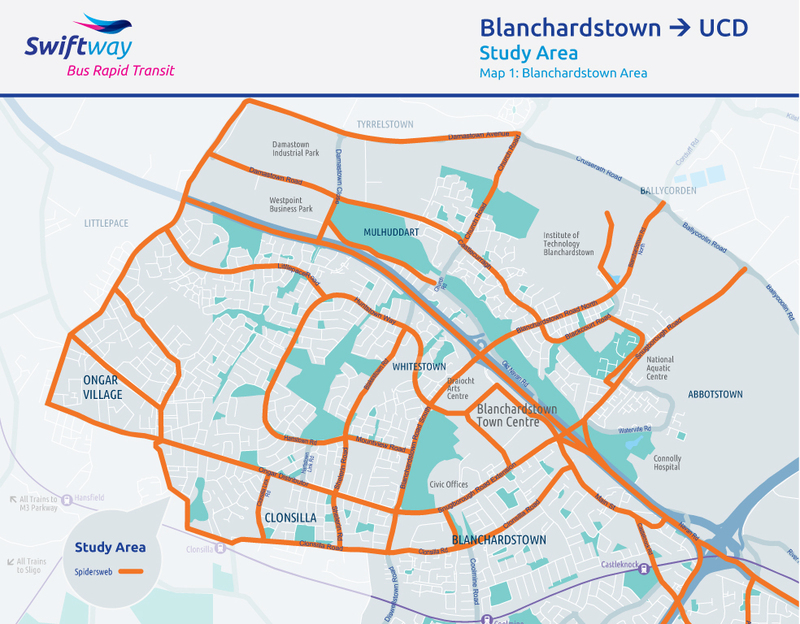 This scheme is intended to serve the busy corridor between Blanchardstown and UCD including the City Centre, with 34 stops identified at key locations along the route. 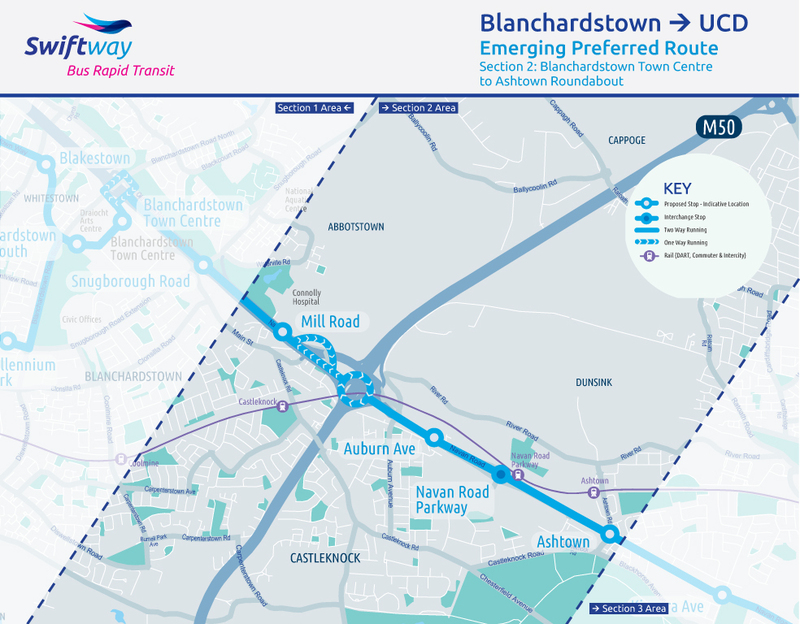 The proposed services start in the vicinity of Beechfield Avenue in Ongar, and also adjacent to the Castlewood Estate in Huntstown, before serving Blanchardstown Town Centre. 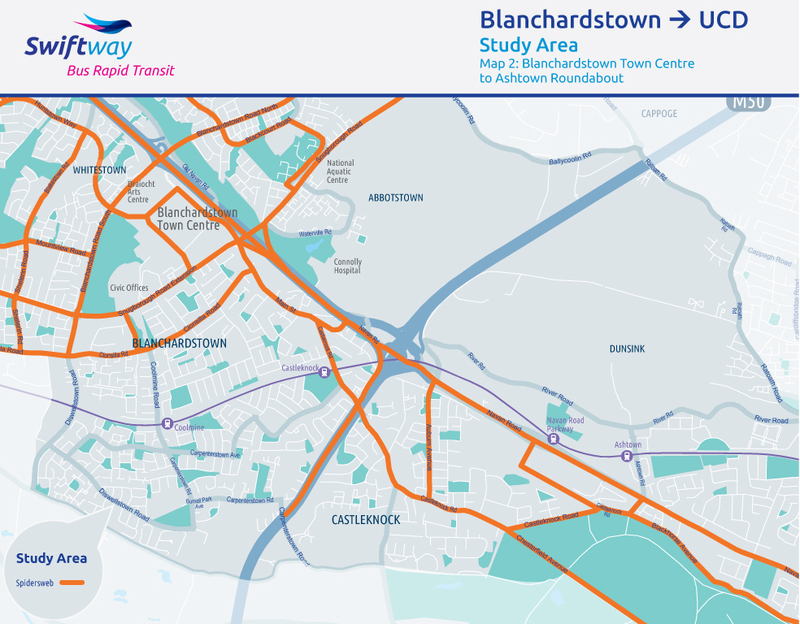 From Blanchardstown Town Centre, it runs along the N3 / Navan Road to the Ashtown Gate Roundabout, with stops conveniently located to serve Blanchardstown Village and Castleknock. 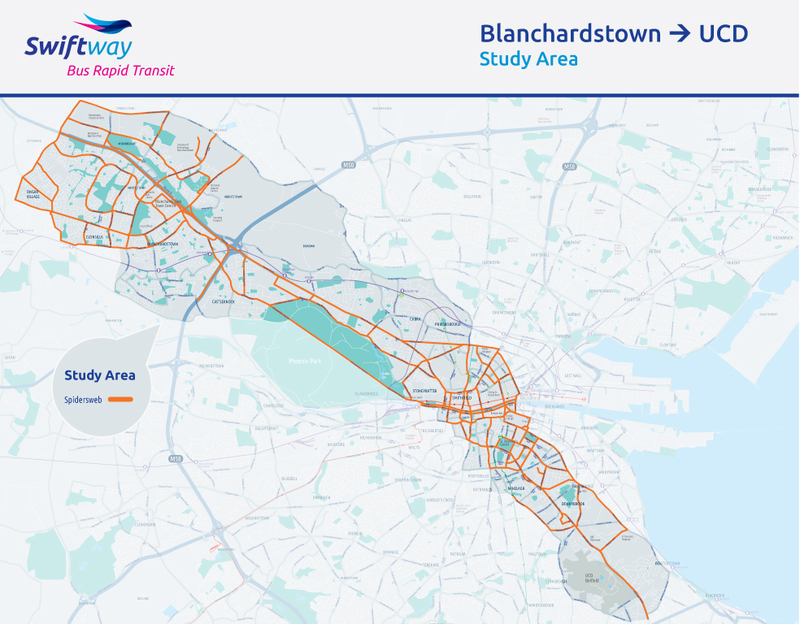 Cabra Road, Prussia Street to Brunswick Street North, via Manor Street / Stoneybatter. 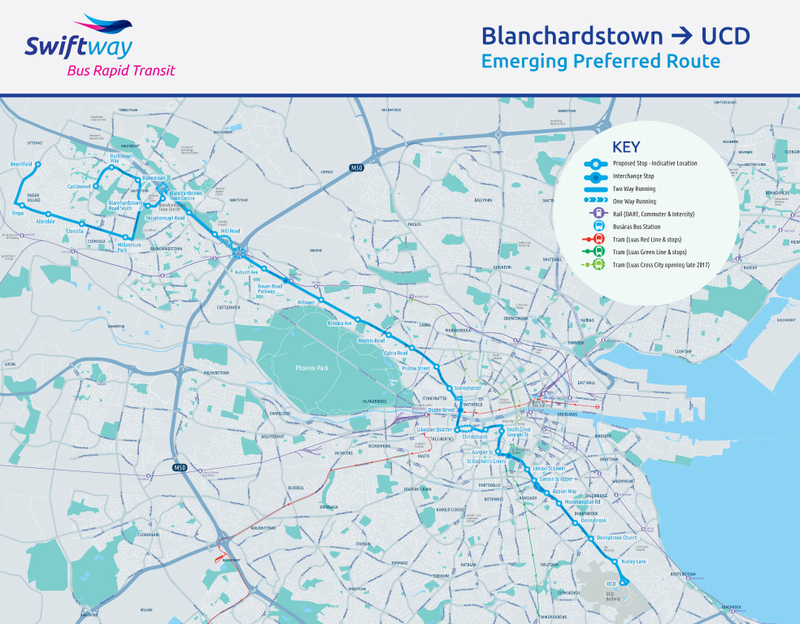 From here the route splits into an inbound one-way section along Brunswick Street North and George’s Lane with a corresponding outbound one-way section along King Street North and Stoneybatter. 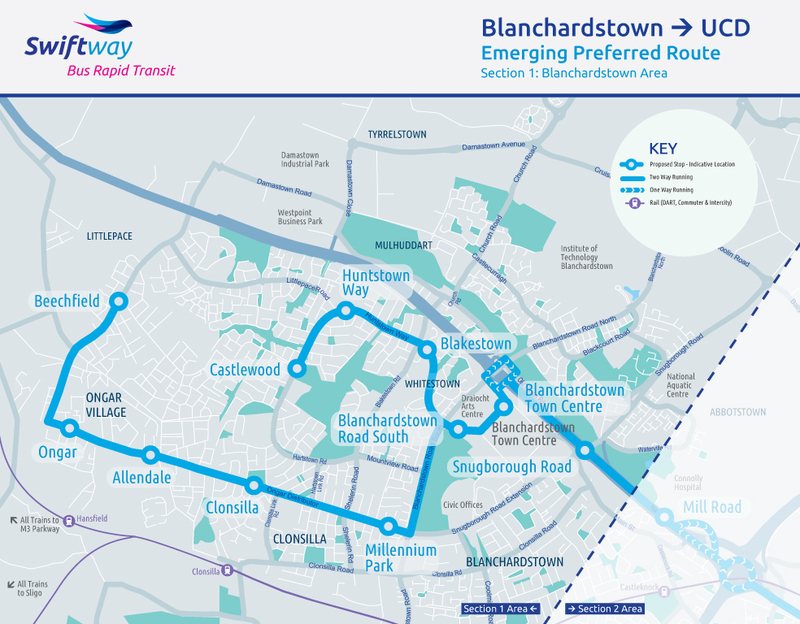 Following this loop the route joins back together before running along Queen Street, where it crosses the River Liffey at Mellowes Bridge and continues onto Bridgefoot Street. 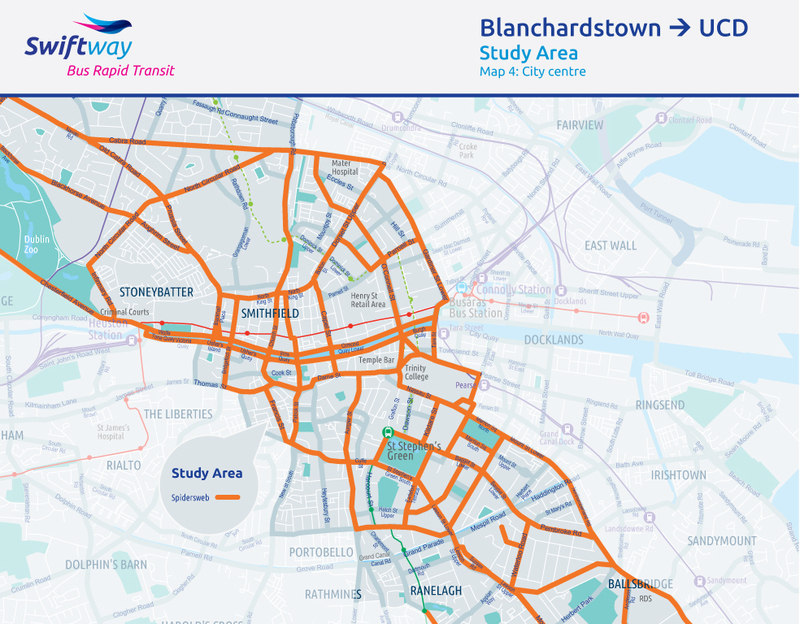 with a corresponding outbound one-way section along Cornmarket, Thomas Street and Bridgefoot Street. 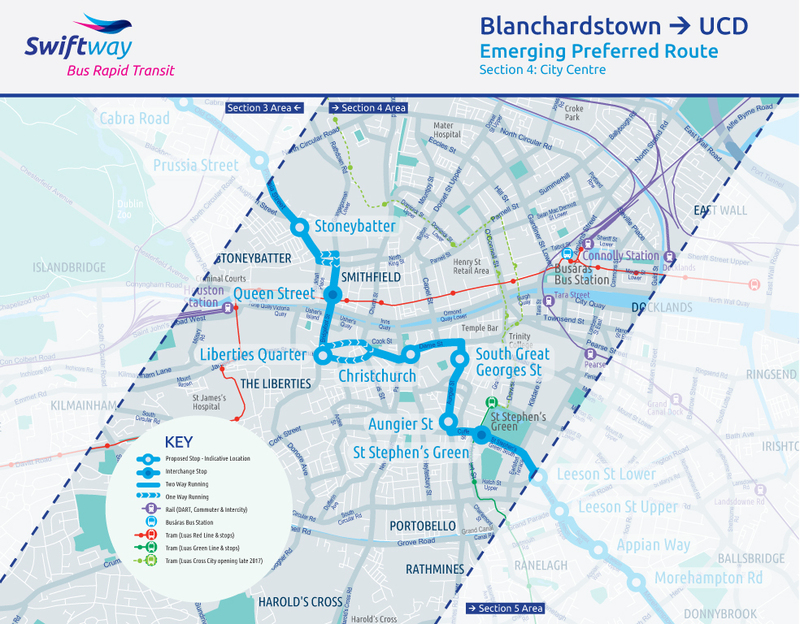 The routes then join back together and continue along High Street, Christchurch Place, Lord Edward Street and Dame Street before turning onto South Great Georges Street. 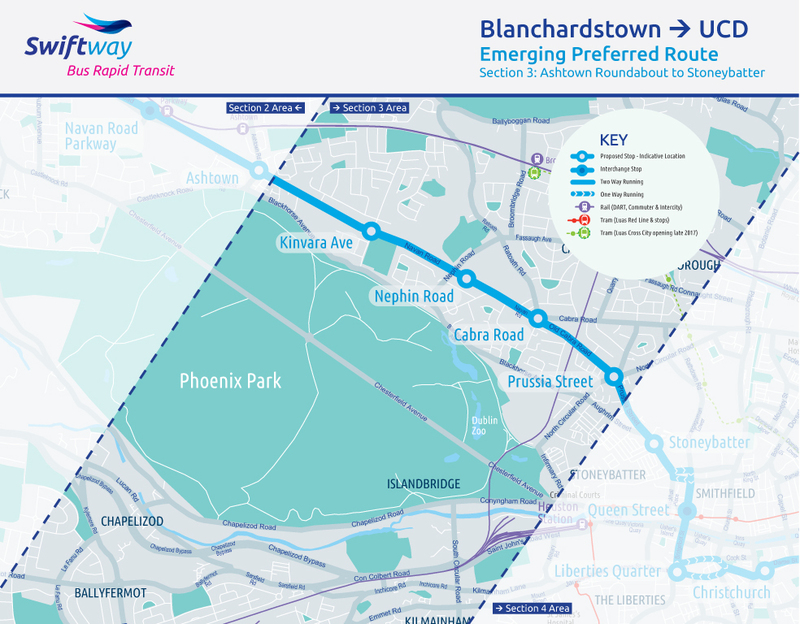 The service then runs along Aungier Street and Redmond’s Hill before turning on to Cuffe Street and continuing along St. Stephen’s Green South, providing a connection with the existing Luas Green line and Luas Cross City. From St. Stephen’s Green South the route travels along Leeson Street Lower, crossing the Grand Canal at Eustace Bridge. 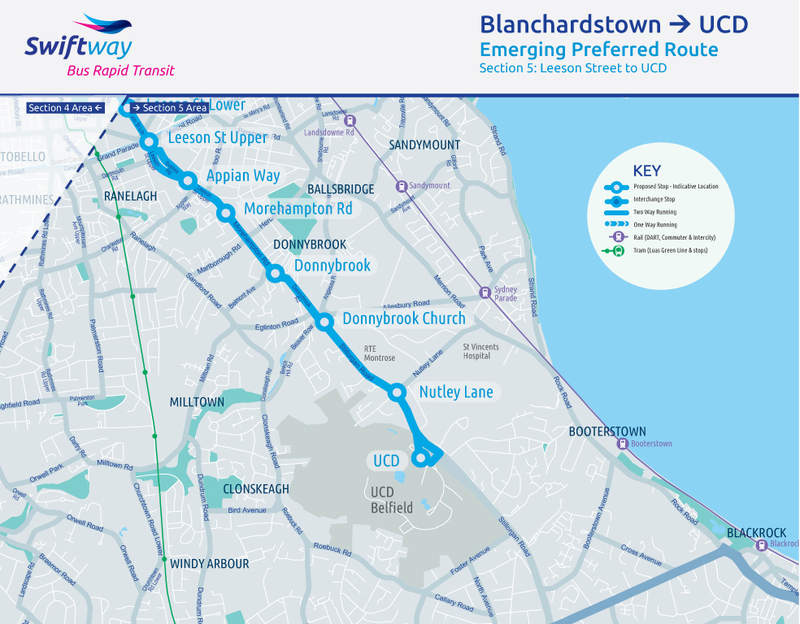 Continuing south, the route splits into an outbound one-way section around Sussex Road and an inbound section along Leeson St Upper, converging again at the junction of Leeson St Upper and Sussex Road. 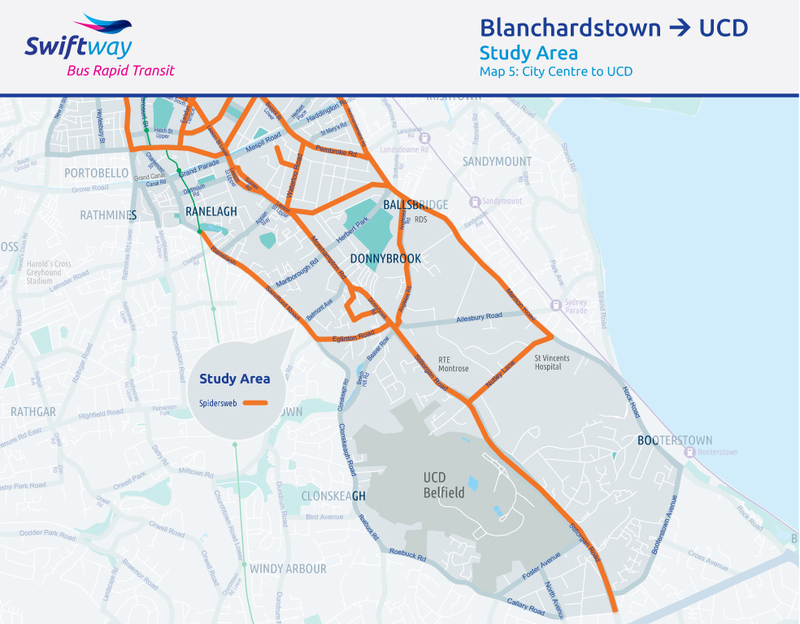 The scheme continues along Leeson Street Upper, Morehampton Road and Donnybrook Road, with a stop located in Donnybrook village. 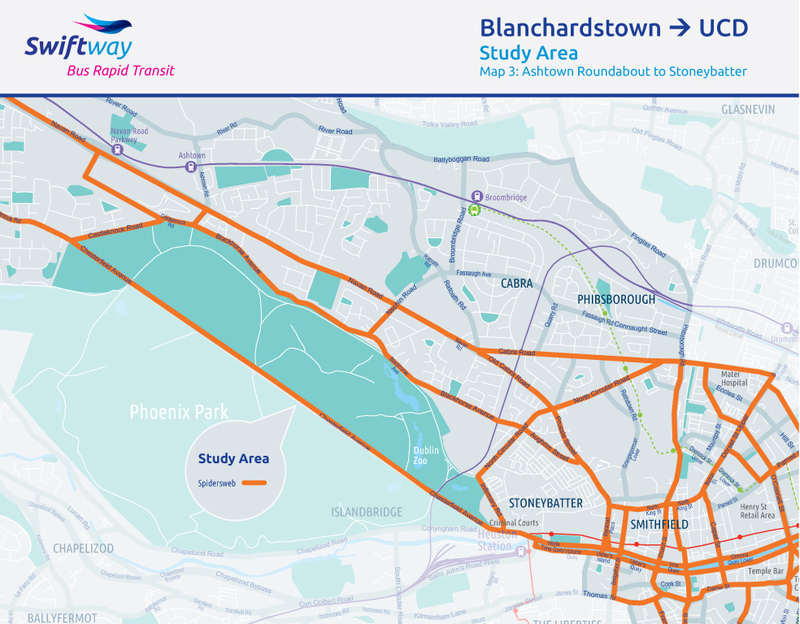 The route continues southbound along the Stillorgan Road to the terminus at UCD.